After completing a 3D print, you have some further options to add strength and a fine or smooth finish. In this section, we discuss some postprocessing and finishing options, along with exciting materials that are now available for desktop 3D printers. Sanding, filing, cutting, and polishing are ways to manually refine many 3D-printed plastic materials. You can use polishing wheels and sanding machines, but be sure to run them slowly; otherwise, they tend to melt the plastic rather than smooth or polish it. 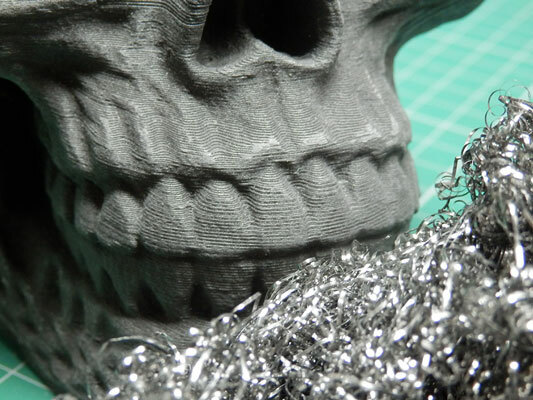 Celtic Skull model designed by artec3d and printed in Proto-Pasta Stainless steel 3D Printing filament. A 3D-print object being polished. When an automated or assisted finishing process is desired (for example, the use of a machine to lower a printed part into vapor or solvent baths to make the plastic shine), specific plastic formulations are being created and devices are being developed to help with the postprocessing of 3D-printed objects. The Polysher, shown here, uses poly vinyl butyral (PVB) plastic 3D-printing filament to print parts on your desktop 3D printer as normal. You then place the printed parts into the Polysher machine along with a small amount of isopropyl alcohol (IPA). The Polysher vaporizes the IPS solvent and that slightly melts the outer surface of the PVB printed object to smooth out all the fine lines you always see on any 3D-printed object. 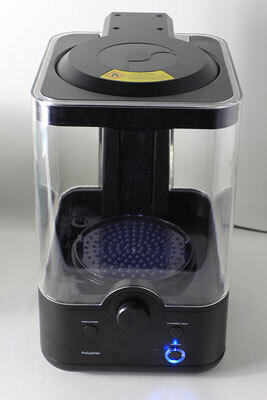 The Polysher seals in the vapor and controls the generation and duration of smoothing to produce a shiny finish, as shown. 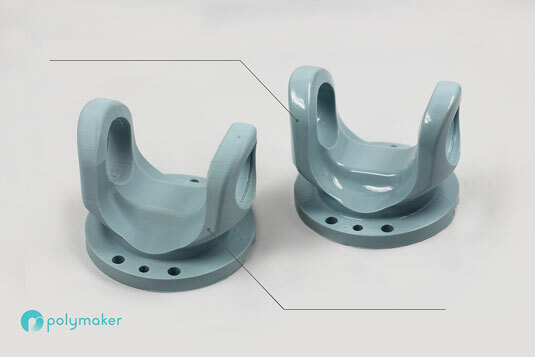 This process can also make the final object watertight and strengthens the printed model due to the fact the layers have been remelted together. The result is a model that looks like it was injection molded rather than 3D printed. This is basically what every product designer would need to complete the finishing of a 3D-printed model without any hard work. Before (left) and after (right) the use of polysmooth material and the Polysher. Alternative methods of finishing an object can be complex and difficult to manage, so consider carefully whether you want to attempt using them. Using acetone on ABS printed objects, for example, melts the surface and makes it smooth, fuses the layers, and adds strength. The result is a finished, glossy appearance for the 3D-printed object. Take great care, and do your research; acetone and isopropyl alcohol are both flammable. Acetone smoothing of plastic is widely described on the Internet, but we don’t recommend using this finishing process. Unless a professional device similar to the Polysher becomes available for ABS or other materials, avoid acetone smoothing of ABS. Dipping or painting on liquid resins or coating like the XTC-3D from Smooth-On, is a straightforward way to finish a 3D-printed part. This method often adds strength and provides a smooth finish. One negative aspect of applying coatings is that coatings can change the size of the finished object. They also sometimes hide or fill small details of the model that you may want to remain visible. Read all manufacturer’s instructions and wear appropriate protection before applying a coating to your object.